Along with the block, there would also be a core set which would include reprints of cards that would have errata for rummage and loot, and then a commander set with 4 preconstructed decks, one of which would be a red and white color deck that has a value engine based off of rummaging (perhaps the commander would have a triggered ability for whenever rummaging occurs). The idea here would be to make it easier to create cards that have abilities related to rummaging and looting. An example would be something like, "Whenever you rummage, draw an additional card." Since this would change a lot of cards by making any more cards discarded or drawn after 1 being optional, I would like to ask about if this makes any cards potentially broken (such as Chandra, Flamecaller, which would mean you rummage up to your current hand size, then you draw a card). Maybe for higher rummage and loot numbers you should add a mana cost. 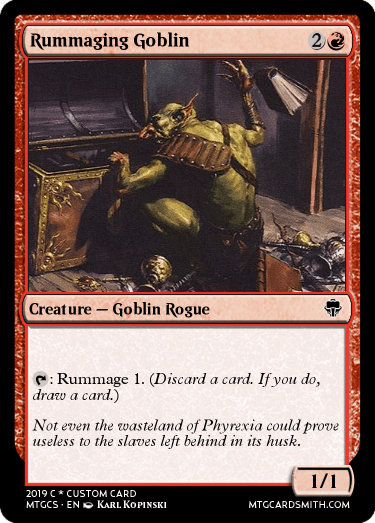 Tbf, rummaging goblin is actually a reprint from older sets. This is just the updated text for it (with set-relevant flavor text). In the past if it would be more, there was either a mana component or you needed to discard your entire hand. Thanks for the advice though. The main issue with this is that most often the discard is a cost, so the current version of Rummaging Goblin can't draw you a card unless you first discard, while, this new version draws you a card either way. The difference between. T: Discard a card then draw a card.